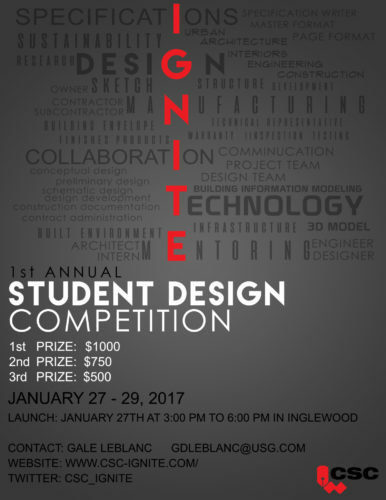 The event brings together students in SAIT’s architectural technology and Mount Royal University’s interior design programs. Teams will be made up of members from both schools, who will be required to work collaboratively to build shared understandings and skills. The goal is to design a 14-m2 (150-sf) pavilion for the Music Mile Alliance of Inglewood. With CSC Calgary Chapter mentors acting as the bridge between both schools and students, the competition is scheduled to take place over the January 27−29 weekend at SAIT’s MacDonald Hall. Part of the competition rules dictate each design team must take one part of its design concept, and write a specification with the ‘logged’ help of industry mentors who will be available for consultation on each of the two days of the competition. For more information on how to volunteer (or sponsorship opportunities) visit www.csc-ignite.com.